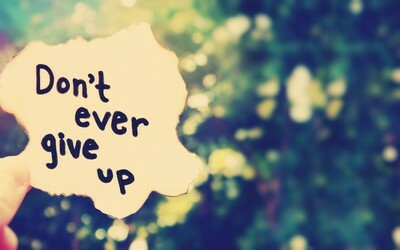 “Don’t give up”! Easier said than done isn’t it? How have you found strength to not quit or give up on a goal/project or dream at times you have really wanted to? Please comment with your responses below…. When you give up, you give up on yourself. Don’t sell yourself short and don’t let anybody bring you down. If you can dream it you can do it. There have been millions of dreamers before you and if they had given up the world wouldn’t have been the same. Take the example of the Wright brothers who faced sever ridicule when they tried to make flight a reality. Everybody laughed at them and told them it was impossible. They proved the world wrong, and now flight now is considered a common means of travel and it has changed the world. Everything you need to reach your goal is already inside of you. Don’t make excuses, if people can play sports at the Olympic level with disabilities; your short-comings begin to look irrelevant. Be thankful. And use your God given blessings. Regret is the worse feeling a person can feel. Don’t put yourself in that position and do what you have to do, now. You want to prove it to yourself and the world that you can. Don’t let anything stop you from your goal. True failure isn’t when you miss the mark; but it’s when you give up. You are more capable and quitting is for losers. There is no better feeling in this world other than knowing that you faced an obstacle and that only through grit and determination you overcame it and became successful. It might be really tough now, but it can all instantly change. If you keep going at it you never know when you’ll hit a breakthrough. Don’t be like the person who dug a well 50m and gave up justifying that he was digging a dry well. And the person who came after him dug 1 m and hit water.